I bought this as a gift for my boyfriend and he absolutely loved it. The price was especially great, considering Nordstrom was selling it for between $600-700. Adding the durability of an all-steel case with the styling of the popular Colormark Series, this Luminox watch is now available with 'Blackout' color treatment. This stylish watch features tritium illumination for easy timekeeping in all conditions. Image on website does not accurately reflect actual color. 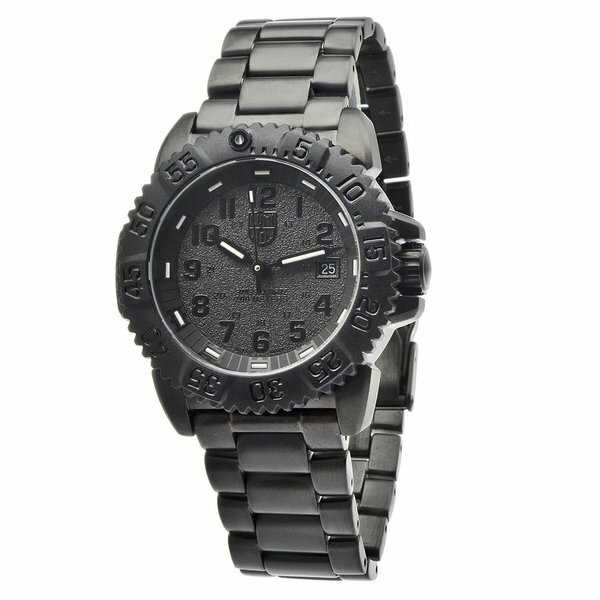 Watch is black with black face, not the lighter color face as shown. Somewhat difficult to view under low light conditions if not dark enough for luminous markings to be easily seen. Standard luminous markings on a non luminox watch are easier to see under lower light conditions but luminox markings much better under no light conditions. Black finish on watch not very durable, expect the black finish on watch to wear off easily revealing the under lying steel color. If this is important to you recommend going with a model in all steel and not the black finish. Have only worn the watch 7 or 8 times in office type work setting and already showing wear on bracelet portion of the watch. Down rated watch because of the lack of a more durable finish (should have been ceracoated or some other more durable finish). Expect this watch to be a "black and silver"out watch within a few weeks of regular wear. Great watch, looks great! Nice to look at in total darkenes, designed for the Navy Seals, so you can’t go wrong! Get them from Overstock while you can and save some money.